BSNL to offer 1GB free data + Unlimited BSNL Calls with Combo STV 146..
General News: BSNL to offer 1GB free data + Unlimited BSNL Calls with Combo STV 146..
General News BSNL to offer 1GB free data + Unlimited BSNL Calls with Combo STV 146..
BSNL has announced the revision of its most popular prepaid Combo STV 149* (MRP is Rs 146 for Kerala Circle) & Combo STV 339* with effect from 14th June 2017 onwards in all the circles. As per the latest information, BSNL customers may enjoy exactly double data usage of 1GB free data in Combo STV 149* which presently offers 500MB free data along with true unlimited BSNL calls. Similarly, in Combo STV 339, customers may enjoy increased other network calls of 30 minutes/day instead of 25 minutes/day. There is no change in per day data usage which will remain the same i.e., 3GB/day without any speed restrictions. However, the validity of both these packs will be reduced to 26 days from 28 days from 14-06-2017. * If denomination is not technically feasible/denomination is not free in any particular Telecom Circle, the denomination may be fixed in the range of +/- Rs. 3 but should not be in multiple of Rs.10. All the above promotional offers will be available for the period of 90 days from 14-06-2017 on wards. BSNL's Combo STV 99 offers unlimited local/STD BSNL to BSNL with 1 GB data for 26 days which is available for prepaid mobile customers in Kolkata Telecom District, West Bengal, Bihar, Jharkhand, Assam, Gujarat, Madhya Pradesh, Chatisgar, Maharashtra and Rajasthan. Similarly in other circles it varies from Rs 119 to Rs 149. BSNL's Combo STV 339 is far better than Jio's data offer since it offers three times more data usage. 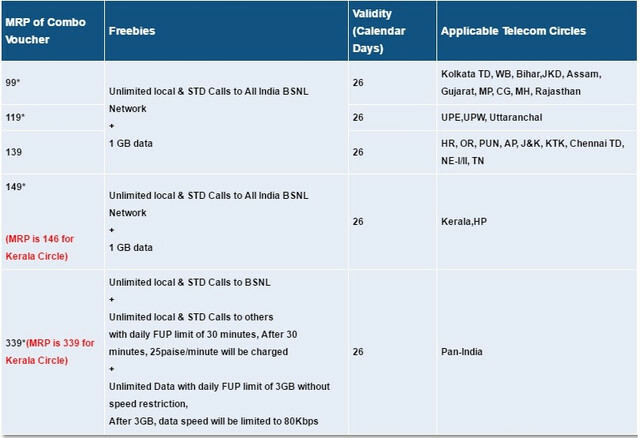 A BSNL prepaid mobile user may get 78GB of free data @ just 339 with Unlimited Voice Calls.